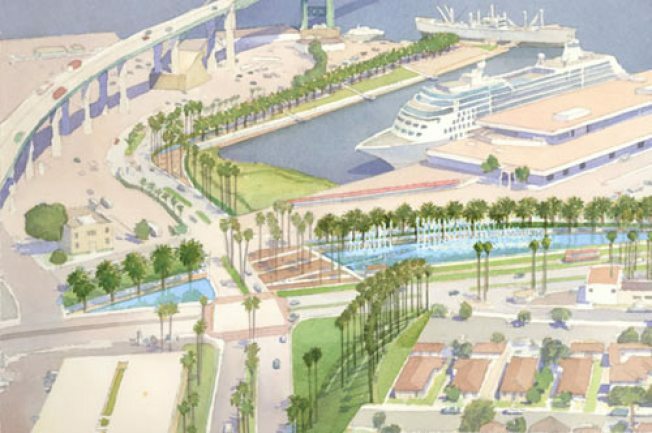 The LA Times reports that the environmental impact report--and it's a tidy 4,000 page document--for the contentious San Pedro Waterfront Plan is out, news that is once again causing much debate about the project among locals. As noted last year, the project would transform the aging 42-year-old Ports O' Call area into a more Dinsey-esque row of shops, tourists, and cruise ships. Those in favor of the project include Michael Christensen, deputy director of development for the Port of Los Angeles, who compares the area to a "big blank canvas" in need of a real estate development. Those in opposition include Janet Schaaf-Gunter, who sits on the executive board of the San Pedro and Peninsula Homeowners Coalition. "The port is expert at putting a snazzy public relations spin on things to make people hopeful," she tells the Times. "Then they plow ahead with plans that serve their own interests." Anyone who has some spare time at lunch can read the EIR plan; it's available on the official web site.